Two very different couples. Two very different lives. Yet somehow they manage to keep things between friends. Schoolteacher Jason and Harry the cop have a pretty good life together. Or at least they always have in the past. When Harry starts acting strangely, withdrawing from Jason and displaying bouts of mysterious anger, Jason starts to wonder if he’s losing his hold on what he and Harry share. He turns to his friend Samuel, a college roommate, for a little moral support. Antique dealer Samuel has enough on his plate, buying a new house with his lover, Peter, and keeping up with their inventive love life. Luckily for Jason, Samuel’s lover, Peter, is also a good friend of Harry’s. When Peter hears about the troubles between Harry and Jason, he forces Harry to confront his demons, and to give Jason the chance to help. Can Harry and Jason come to terms with secrets that might change their lives forever? With Samuel and Peter’s help, they just might, as they find out what friends are for, and what it means to let someone help share the load. 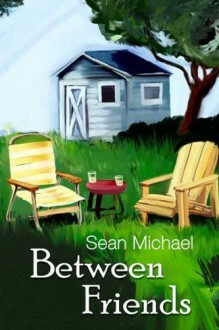 Sean Michael creates a finely woven web of friendship, where two couples and two sets of friends become family, and where the intricate dance of everyday life comes alive in the most beautiful way. 3.5 STARSWhile I liked this book I felt as though I had missed a previous book...but this is Book 1 in the series! Events - serious events - were mentioned that impacted these characters and I was left feeling disconnected.